The American Ninja Warrior TV show was spun-off eight seasons ago from the Japanese completion series Sasuke. And while since its first season only two competitors have actually won the course, a number of local warrior hopefuls are waiting for a call-back for the ninth season of the popular obstacle course show as Fit941 goes to press. LIVE Training Center is where competitors, aspiring competitors, or just someone who has watched the show comes to train on obstacles from the actual show to best prepare for the task at hand. But training like a ninja is more than just trying to get on national TV. It’s a fitness lifestyle. “The show is only a few months long so there are leagues and events that fill in the time between shows in an effort to bring awareness to the sport and to keep everyone in shape,” Dale says. And then there’s the thing about ninjas, he says, they don’t really compete against each other as much as against the course itself. “One of the very cool things about this sport, is the camaraderie; the ability to share in each other’s successes,” he says. That’s cool, but what about the person who wants to give it a go but is a bit intimidated? Don’t get us wrong, as Dale says, there are fundamental skills necessary including balance, upper body control and grip strength. “Those are the functional fitness aspects needed, but we work to make sure each and every person gets the help they need no matter their skill level or ability,” he says. At LIVE, there’s not only the Ninja Obstacle Training Open Gym but the Boot Camp classes that LIVE is known for, are held daily from 6 a.m. to nearly 6 p.m. And on Saturday’s there’s an Obstacle Course Racing (OCR) FIT class and a 2 p.m. Kids Ninja Warrior Class. Another 941 location where one can train like a ninja is the EVO Athletics obstacle courses, from one for toddlers to teens to adults. For now, according to its website, ‘Ninja Warrior Readiness’ classes are available for kids 5 to 18, but ‘Open Ninja training’ is for everyone. Athletes can train with a coach in one of their classes or just come check it out during open ninja hours. For adults-only sessions, 18 and up, that’s Mondays, Wednesdays and Fridays from 10 a.m. to 2 p.m. (Note: participants must be at least 5-feet tall.) For kids from age 7 to 17, open ninja time is Fridays from 7 to 9 p.m. and includes trampolines, foam pits and spring floors. And then there’s the ‘anyone’ hours: Mondays from 6 to 8 p.m.; Thursdays from 7 to 8 p.m.; Friday from 5 to 7 p.m. and Saturdays from 10 a.m. to 12 noon. 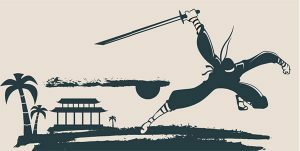 The ninja classes at EVO focus on agility, hand eye coordination, trampoline exercises, and body awareness. The class includes instructional trampoline time as well as agility obstacle training. For more information on how to train like a ninja, visit EvoAthletics.com or LiveTrainingFl.com.